In our large format class, we use Calumet view cameras. One of their unique properties is the ability to tilt, swing or slide their lens and film planes. This is called Scheimpfluging and allows for very interesting shifts of the focal plane in images. Below are pictures of a cube. The middle one shows the plane of focus over the whole cube. The one on the left has the focus only on the top of the cube. The right one’s focus intersects the middle of the cube (click on image to view full size). 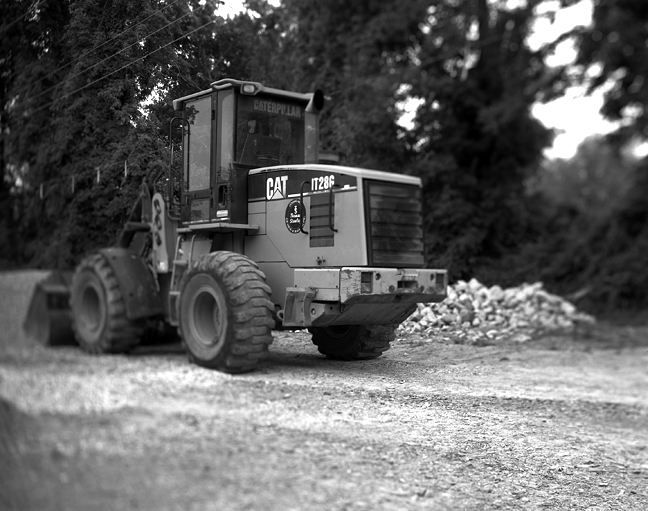 The image below of the Caterpillar tractor is an example of trying to apply this principle in order to alter perception of a image and control the point of focus. The focus here cuts through the center of the tractor and behind it, leaving things on either side out of focus (click on image to view full size). This entry was posted in Large Format Class and tagged 4x5, black & white, cube, large format, scheimpflug, student work, unusual focus, view camera. Bookmark the permalink. lol you took Holly and I’s teach me how to Pflug idea! Nice Eric, I love the way you illustrate and explain hoe the Scheimpflug technique works and the joys of shooting with the Large Format Camera.